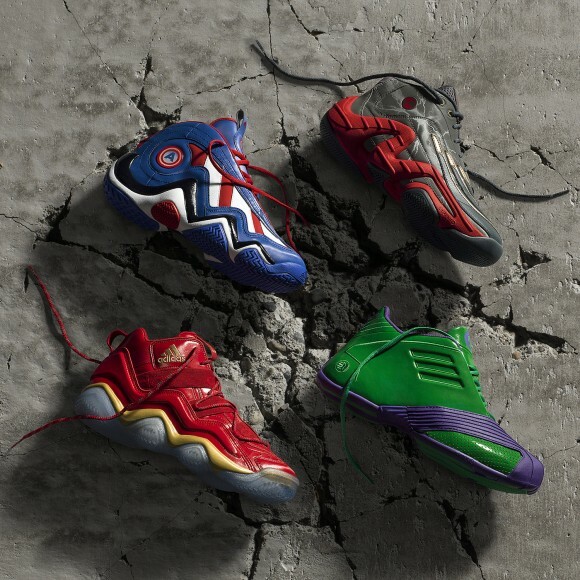 adidas has officially unveiled their upcoming collaboration with Marvel’s The Avengers. Drawing inspiration from comic book characters of the big screen, the retro collection pays homage to Captain America, Hulk, Iron Man and Thor from the blockbuster film Avengers: Age of Ultron. Design specs include colorways tailored to each superhero, icon graphics featured in the sockliner and the Avengers logo highlighted on the tongue. Check out a detailed description on each character’s design inspirations below, and let us know if you’ll be grabbing any of the collection. Displaying the hero’s signature red and white stripes with adidas’ three, this Crazy 97 blends a bold, blue design that calls on American tradition. The model features a metallic finish to reflect the Captain’s shield, which is also incorporated as a color shifting emblem on the sneaker’s upper. This T-Mac 1 boasts the Hulk’s radioactive glow and iconic purple pants as the embossed metallic pattern upper embodies his chiseled features. The Hulk Smash emblem sits atop the heel with finished Hulk green branding and a matching purple toe. This Top Ten 2000 features an all red metallic upper and gold midsole representative of Iron Man’s body armor. An iced outsole plays to the hero’s propulsion thrusters, while the circular emblem on the heel symbolizes the arc reactor in Iron Man’s chest. The reflective upper features lightning bolt flashes to represent Thor’s hammer, keeping this edition of the Real Deal true to the Avenger’s godly prowess. Gold hits at the end of the iconic three stripes reflect Thor’s chest plate and tinted grey outsoles represent his armor. 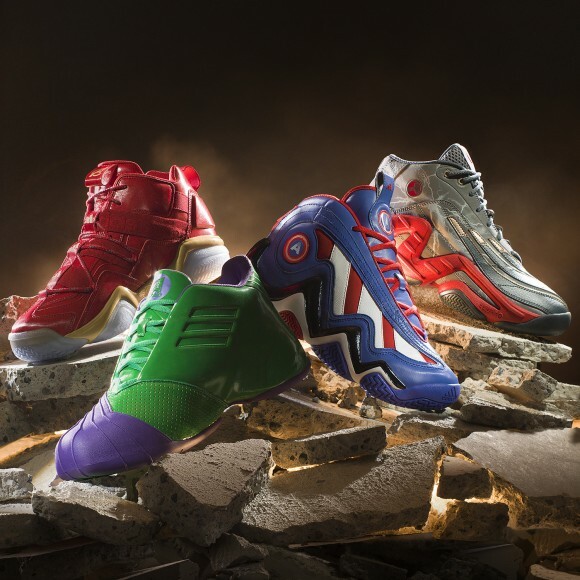 The adidas Avengers pack will be available for $125 at adidas.com on July 4. Cap’s and Thor look good. Nice job adidas, but a little too much for me. I will probably buy the Iron Man inspired Top Tens. I hope Iman wears these in the NBA Finals. these are being reported elsewhere that they will only be available in kid sizes.